Oh... hello, perfect summertime dress. I'm so pleased to make your acquaintance. Alright, so I really am smitten with this dress. It's super lightweight chambray and it has polka dots. Summer win. I'll be back soon with a really fun giveaway from Ugglebo Clogs. Aren't these red ones gorgeous? I love them and they are so comfy! It really is the perfect summertime dress(and it goes so well with your hair!) So lovely. Love those shoes, the perfect balance of clunky and delicate! I always love your Weekly Wears :) This would be so cute for a 4th of July BBQ! Such a cute dress, and your earrings are adorable! Adorable outfit. Your Weekly Wears posts never fail to inspire me. Those earrings rock too! Lovely!! You're so gorgeous. And yes the clogs are amazing. 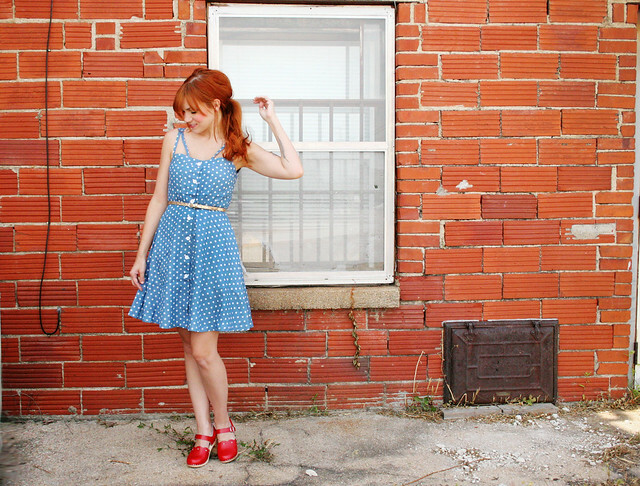 Your polka dot dress is gorgeous! I love how summery and pretty it is. Those red clogs are a perfect choice to pair with it too. I just love that dress and the adorable earrings. I love that dress, Katie! The double straps are so pretty! The dress is absolutely adorable and I want these shoes! They are so cute and they are red!!! I noticed lately, that I really seem to love red when it comes to shoes, so they would fit perfectly into my "collection" of red shoes. You're always an inspiration for me!Thank You! Who knew that Target had such cute things! Although I heard that their jewelry had lead in it, so be careful! your dress is the sweetest! <3 . that is all. I definitely have that belt. I bought it on clearance at Target. Twinkies!!! What a pretty outfit! Love the dress and those shoes! That dress is the CUTEST. Love your earrings, too! I love your clogs. Reminds me of a pair I had as a kid. Such a cute dress. Looks great on you! how are you so adorable?! love that dress and those shoes!! I've been swooning all over that dress- need!! there's just something about the combination of blue + polka dots + a splash of red that is so incredibly pretty. love this outfit, katie. and those Matryoshka earrings (from target!?!! yay!) are adorable. i'm gonna look for a pair when i stop by the mall later today. That dress is perfect! I'm going to a wedding in a few weeks, and this dress would totally work. Summer-y and yet demure, and fun! And I'm a redhead too, so I know if will look good with my hair too, haha. Take a look at my blog, I just did a dress post where I picked all of my favorite dresses for Summer. You'd look cute in all of them! Every bit of this outfit is perfect. I love the easy summer breeziness of it! Love that the dress is chambray, it's so pretty! You have such a cute, petite, little frame! I love it! Super cute outfit! love the clogs. this dress looks so gorgeous! the dress is gorgeous and so is your hair color! I love polka dots! That dress looks great on you and I love how the red shoes compliment the dress so perfectly! That colour looks so good on you, it matches your skintone perfect! the dress is so cute and it fits you perfectly! That is the perfect summer dress! You look perfect in it! That dress is so great! You look perfect in it! How tall are you? You seem so petite!